This is an excellent formula for high fever aggravated by constipation, and is particularly useful in children’s fever, including fevers due to measles, mumps and tonsillitis. 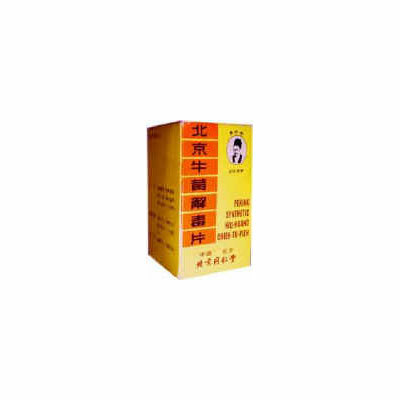 Niu Huang Jie Du Pian is a popular and well known herbal supplement that is useful in the health of the inner ear, mouth teeth, throat and salivary glands, and the gastrointestinal and respiratory systems. This is an excellent formula for high fever aggravated by constipation, and is particularly useful in children’s fever, including fevers due to measles, mumps and tonsillitis. When symptoms are due to pathogenic wind accompanying common cold, combine with Yin Chiao Jie Du Pien. Other ingredients: Sugar, Magnesium stearate, silicon dioxide, FD&C Yellow 6. Clear Heat, reduce inflammation, detoxify Fire Poison. Frees the stool, open orifices, relieves pain. Headache, vertigo, sore throat, gastric fever, mouth pimples, tongue ulcers, dry throat or mouth, bleeding gums, acute ophthalmia, acute dysphasia, mumps, earache, toothache, children’s fever, anorexia, nausea. Also constipation caused by excess heat (not Deficient Yin type of constipation). Skin infections such as sores, carbuncles, boils. Take 2 tablets 2 times a day, in the morning and in the evening with warm water. Children’s dose to be reduced by half. In more sever cases, especially with toothache, take 2 tablets, 3 or 4 times a day.